One of my favorite scenes in Spring is the return of the coltsfoot. Driving down most any country road in central Pennsylvania you can see these early “dandelions” before anything else is blooming. Of course coltsfoot is an entirely different plant than dandelion, but many people will mistake it for such. Coltsfoot, Tussilago farfara, does look like dandelion, Taraxacum officinale, in that the yellow flowers have many rays, but that’s where the similarity ends. The flowering stems of dandelions are thin hollow tubes, where the coltsfoot stems have noticeable scales. Coltsfoot flowering along a country road in Pennsylvania. 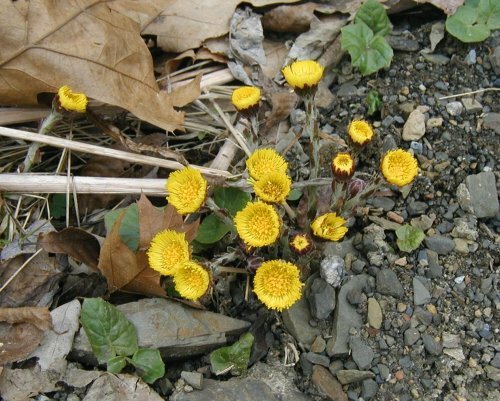 When coltsfoot flowers its leaves are hardly noticeable as they are just beginning to be formed, whereas dandelion leaves are present before it flowers. A dandelion’s basal leaves are narrow, lobed or cleft and at ground level, while coltsfoot leaves are roundish, broad, held high and their shape suggests a colt’s foot. When flowering is over for the season coltsfoot leaves continue to grow until they’re larger than your palm. Another similarity between the two is the white, fluffy seed head produced by the spent flowers. Pictures to come later. I mentioned that coltsfoot is the only thing flowering now, but that is not quite correct. Maybe it’s the first noticeable, native flower. A couple of very small flowers are out now too, namely Pennsylvania Bitter Cress, Cardamine pensylvanica, and Purple Dead Nettle, Lamium purpureum. And the natives are being out done right now by the flower garden bulbs. 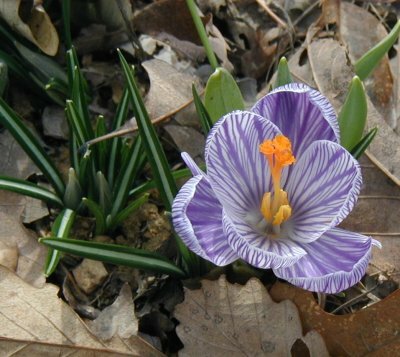 Check out this nice purple and white crocus! Purple and white crocus blooming in the flower garden. Another crocus is about to come up, you can see its bud on the left at the base of its white-striped linear leaves. Stay tuned for more flowering beauties and look around your neighborhood for what’s coming up! hey im building an herb sight and i was wondering if i could use some of your info on it? im not very good with words. I wouldn’t mind if you linked to my pages, but please don’t take the text and use it as your own. The search engines like google want to see original content, so using other people’s content as your own will make your pages drop down pretty low in search engine results. It’s not a good practice for bringing traffic to your site. If you copy words or pictures or other content without giving proper credit, it is plagiarism. Please don’t steal me words! Do you use Firefox browser? If so, try the ‘After the Deadline’ extension. It’s a great spellchecker that will help with your writing!! I see that you have started writing on your blog and that’s great! It takes practice — like anything — to get good at it, so keep on blogging!